At Telsec, we understand the need for businesses to have a professional environment to work and conduct meetings, training seminars and conferences. With our fully serviced private suite rentals starting at $495.00/month, we provide businesses with the opportunity to focus on growth and client service while we handle the administrative activities and functions that come with servicing and maintaining an executive office space. Telsec offers private offices with flexible rental terms as opposed to a conventional office with a restrictive lease which will require the capital expenditure of lease-hold and infrastructure installation, furnishings and equipment expense. Telsec's private, executive offices provide flexible leasing terms allowing for additional space to be allocated at short notice without incurring capital expenditures. When renting a private suite through Telsec, clients receive a professional atmosphere as well as access to various technology and advanced equipment allowing work to be done efficiently and effectively. 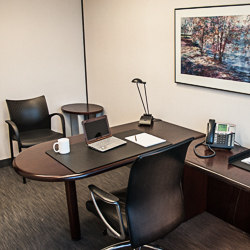 If you’re looking for a private or executive office space for rent starting at $495.00 per month, contact us today for a quote at (416) 363-9035 or toll free +1 877-705-0707. For more information, please visit our services and pricing page.